BANGI, 6 July 2012 – The future of the Geotechnical Engineering in Malaysia will depend on the use of materials dubbed Carbon Nano Tubes, which are deemed as indispensible compounds. 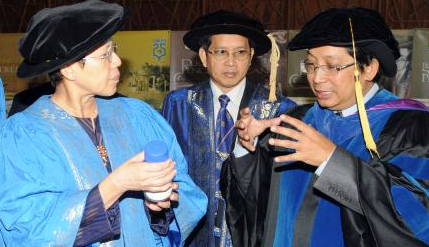 The Head of The Department of Civil and Structural Engineering at the Faculty of Engineering and Built Environment of The National University of Malaysia (UKM), Professor Dr Mohamad Raihan Taha said Carbon Nano Tubes (CNT) are a group of materials with limitless possibilities and are deemed the most important among nano substances. Delivering his inaugural lecture today on Nano Materials and Geotehnical Engineering: Big Problems, Small Solutions, he said nanotechnology is the engineering of functional systems at the molecular scale. Nanotechnology is concerned with objects between one and 100nm (nano meter) in size, which is one per one hundred millionth of a metre, or 0.0000000001 meter. Geotechnical Engineering is the application of science and engineering to find ways to treat soil or earth for the construction of secure foundations for buildings or the rehabilitation of infrastructure. He said CNT is the strongest and hardest synthetic material known today. It has excellent electronic and electrical conducting properties and has been used as a reinforcing agent to improve the qualities of mortar or concrete in construction. Lately there has been concern of toxicity where CNT was used and studies are ongoing. Ironically, CNT can also be used to reduce toxicity due to microbial or chemical reactions in the soil. Prof Raihan explained that Carbon Nano Tubes and other nano materials has been successfully used together with Portland cement in mixtures of concrete or mortar to reinforce soil. Even small amounts of CNT showed a marked improvement in the strength of the mortar. CNT is the invention of Japanese scientist Sumio Iijima in 1991. Experiments along this line are continuing. Nonetheless it has given a boost to the use of nanotechnology in Geotechnical Engineering. Prof Raihan said that there are many basic geotechnical concepts which have basis at the nano level. For example the characteristic of CNT with its relatively large surface area compared to other molecules makes it suitable for absorption of pollutants. Studies showed that CNT absorbs the toxic compound Dioxene many times more than other forms of activated carbon used in filtration systems. CNT was also found to be effective in adsorbing heavy metals when coated with the oxides of heavy metals. Other nano substances also yielded encouraging results in laboratory experiments at the Department of Mechanical and Materials Engineering, UKM. Among these are Zeolite, Bentonite, Kaolinite and Ilite. Zeolite is a crystallised Aluminium Silicate which has excellent absorbing and ionic exchange properties. Kaolinite is in essence a form of clay which can absorb toxins in soil. In use, it looks like white flour but is actually hydrated Aluminium Silicate. Prof Raihan, however, said that research on the use of nanotechnology in geotechnical engineering is not an end in itself but a means to open avenues in other fields of civil engineering involved in the rehabilitation of infrastructure. He proposed that such research be given added stimuli because of the risks faced by man-made structures and buildings in Malaysia. Natural disasters and inclement weather such as tsunamis, landslides, thunderstorms and even heavy rains can play havoc on concrete structures. More recently earth tremors have been felt in this country and there are concerns that buildings may be affected. Geotechnical Engineering is thus critical to the safety of structures such as multi-storeyed buildings, metalled roads, bridges and dams which rely on impeccable foundations on soil, he said. 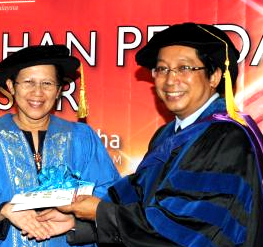 Prof Raihan graduated from the University Teknologi Malaysia (UTM) in 1984 with an Honours degree in Civil Engineering. While at UTM he was awarded the coveted Hussein and KH Chong prizes for best student. He did his Masters at the University of Maryland, USA in 1986 and completed his PhD in Civil Engineering at the Louisiana State University in 1996, before being appointed as an Associate Professor at UKM in 1998. He was promoted to professor in Geotechnical and Geoenvironmental Engineering in 2003.